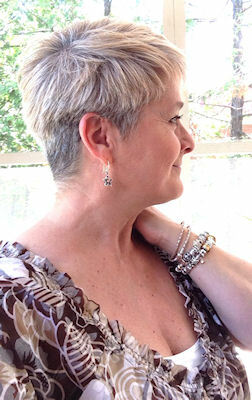 Become a fan of my Facebook page of "coursAquarelle" (click on j'aime up) to receive notice of what's new in my website! the page is only in french. The dates for the SPRING sessios are posted. Here is the FIRST place you should LOOK to know what content has changed, or been added, in the different menus of the watercolor school, the schedules for courses at different levels, the watercolors for sale and small paintings, and the educational section of step-by-step demos, tricks and tips and techniques of mixing colors of Brigitte Charland. In the section pigments, you will find helpfull informations on the methods of fabrication, the chemicals and their interactivity important for watercolorists. 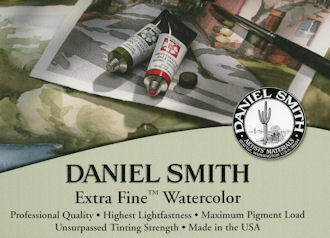 You can look at more than 40 watercolors already sold in the section enjoy. You can find out about my artistic path and some testamonials in the artist. or consult my page the pigments to get a lot more information. 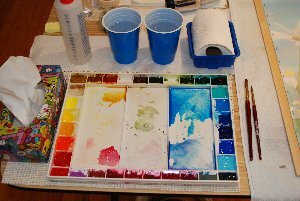 Here is my Masterson palette with my DANIEL SMITH pigments. It is set-up for a left handed. Please, when you buy a palette, do not scratch the mixing areas with sand paper like some poeple do. It is made soft and shiny to mix easier and clean-up without staining. In SUMMER, with big variations of temperature, hot and humid temps could make your palette grow mildew. Go to the section Tricks and tips to reach the link to the demo on how to clean your brushes and pigments. 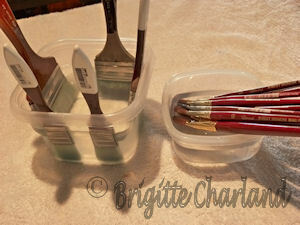 A step-by-step demo on how to do a good clean-up of your brushes and palette before Summer.